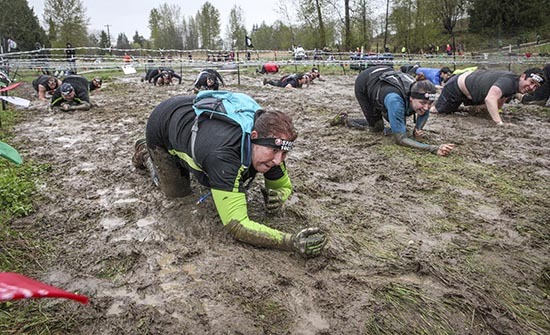 Competitors slip and slither under the barb wire grid during the Seattle Spartan Super and Sprint races on Saturday, April 13 outside of Monroe. The two-day competition drew thousands of challengers who took on obstacles such as sliding down a mud bank and diving under a floating fence to stagger up the other side. The fastest competitors tackling the longer, 8-mile course took about one hour to finish it. The short course was three miles. Left, Ruth Gebhard practices punches and kicks with her sparring partner at the Women’s Muay Thai Class at the Stray Dogs Club in Monroe on Sunday, April 7. At right, 9-year-old Courtney Hufford practices a kick with sparring partner Rebecca Pearce. Hufford’s 12-year-old sister Joy and mother Virgie also attend the class.